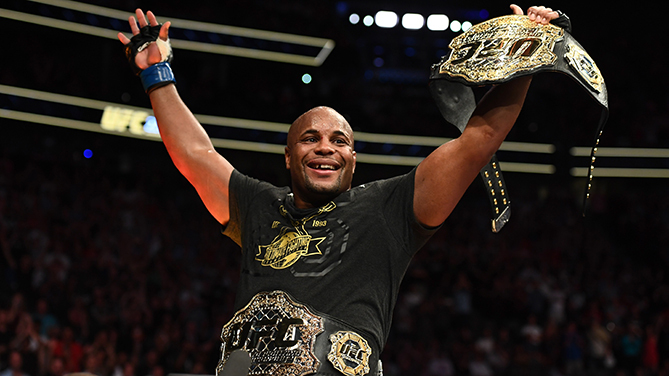 Daniel Cormier wasn’t planning on a third fight to close out 2018. And that was understandable, considering that his previous two bouts saw him successfully defend his light heavyweight title against Volkan Oezdemir in January before taking Stipe Miocic’s heavyweight crown in their July SuperFight. In other words, he earned a vacation. But a visit to Las Vegas earlier this month got that competitive fire burning again, as he watched his teammate and UFC lightweight champion Khabib Nurmagomedov score the biggest win of his career over Conor McGregor in the main event of UFC 229. Now Cormier will headline his own event before 2018 closes, as he faces Derrick Lewis at UFC 230 in Madison Square Garden. And if he’s looking to secure his Fighter of the Year award for 2018, a third win could get him past his friend and teammate. That one way has worked pretty well for the power-punching Lewis, but rest assured that “DC” isn’t going to let that one way become a factor, and it made accepting the fight a no brainer for him. “When something makes sense, it makes sense,” said Cormier, who will be competing in the “World’s Most Famous Arena” for the first time since he was a 24-year-old battling it out in the 2003 freestyle wrestling world championships. “I remember wrestling there and just having this level of excitement that I haven’t really felt in many arenas,” he said. “Historical stuff means something to me, and the opportunity to main event Madison Square Garden is one of those things and I had to jump on it. After a stellar wrestling career that saw him earn a place on two U.S. Olympic squads, Cormier is now leaving a lasting impression on the world of mixed martial arts as he prepares to walk off into the sunset around the time of his 40th birthday on March 20, 2019. For only the second fighter in UFC history to hold two world titles simultaneously, there’s nothing left to prove, but even he admits that with Brock Lesnar presumably in his future and longtime rival Jon Jones about to make his return later this year, things are a lot more interesting now than they were perhaps six months ago. And hey, future boxing hall of famer Bernard Hopkins told his mom he was retiring by 40 but wound up fighting until 52. Did Cormier leave himself an out when it comes to this retirement? Again, he’s got nothing left to prove, but what will take the place of the competition that drove him and made him a superstar in two sports?